Discussion in 'Custom & Handmade Knives' started by Bambara, Mar 26, 2017. Blade: Robert Calcinore San Mai Damascus heat colored with Brownells Nitre Blue salts. Dimensions 9" x 25/32" x 7/32"
Any comments/critique/suggestions are greatly appreciated. Holy cow! That is some serious attention to detail! Great work! My goodness Vlad. You are the Michelangelo of pig stickers. May I ask, since I'm not into the manufacturing side of blades -- just an end user, how many man hours and monetary expense in materials was this venture? 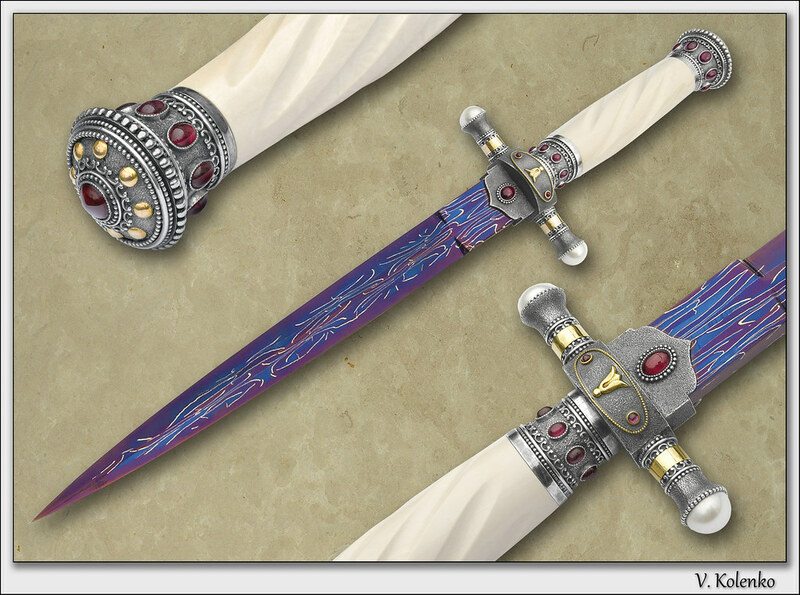 It's difficult to estimate how many hours exactly it took me to make this dagger. It usually takes me about a month or so to make a knife. However, it's not a full time job. I typically spend 2-3 hours almost every evening in my shop/studio on weekdays and half a day or so on weekends (unless my wife drags me out shopping). The materials cost about $600. That is out of this world!! WOW!! Lovely workmanship. Any sheath for it? Thanks! There is no sheath. I was thinkg to make a display stand. I aspire to make knives like yours, a major inspiration. Vlad, to my mind this is your best ever work. I agree it needs a stand to display this piece, it's far too nice to be covered up to be appreciated. Thanks! Much appreciated! Half of the credit for the dagger should go to Robert Calcinore. I need to come up with a design for a stand. that must have taken forever to make ! excellence.